I'm writing this post to you because I know for sure that you follow me, at least I know in person that your Cultural Department Officer does follow me (he told me that in person, March 2011, when I visited the embassy in Sana'a). Please do not gurantee him the visa under any circumastance. It's your chance today to somehow prove that your "pro-democracy". It'd be a good start to have a new page between the US and Yemen. I must admit though, I have no idea how I can overlook the fact that the teargas used against Yemeni protesters, Egyptian protesters, Tunisian protesters.. etc was made by the USA. In adition, it will be VERY hard for me to overlook how you kept sending your envoy to speak to Saleh when he was in KSA; discussing how bloody he was with protesters. Honestly, it would be very difficult for me to forgive you for many other matters that you caused them in someway or another. Regardless, I believe your given a golden chance to support Yemenis' demands for democracy and ouster of Saleh. This is your chance! Please support revolutionaries in Yemen because they are the future and we'd certainly work with you in fighting the so-called "terrorism". 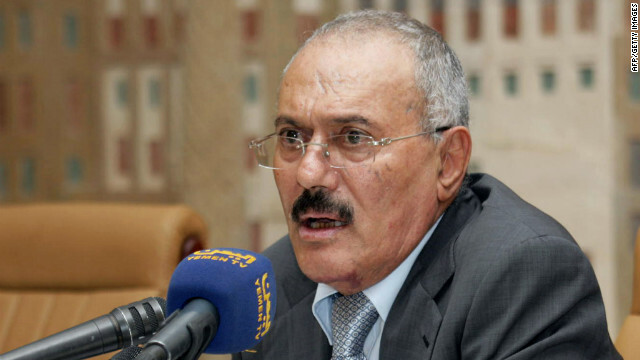 Saleh's days are numbered but Yemen's revolutionaries are the present and the future. Please DO NOT give him the visa...EVER! I've read that you asked Saleh to fully resign and then you could give him the visa to enter the US. That sounds good but how about that you keep asking him to fully resign and leave to KSA, instead. I'm sure that Ben Ali feels lonely and needs a room-mate. Ben Ali would love to have Saleh over. Then, we'll officially call KSA; "Dictators' Country" and everyone gets to be happy!